Today we drove 400 miles through Banff National Park to the town of Jasper and returned to Banff in near blizzard conditions at around 10pm. During the many stops on route to view the amazing scenery and various lakes our day ended with an excellent view of a Grizzly Bear feeding on the road side! As you can imagine I'm totally shattered and off to bed but not before I update my blog with today's highlights, while there fresh in my mind. 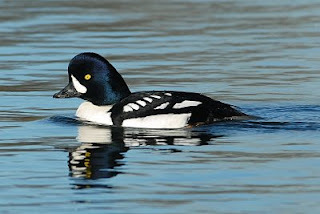 The first birds of the day were a pair of Barrow's Goldeneye (pictured), a species that was high on my list for Canada and a delight to see. Later we passed close by to the Saskatewan River and to my amazement perched on a small rock mid channel was a lone Bonaparte's Gull at roost! Other birds of note today were, Clarke's Nutcracker, Blue Winged Teal, Loon and Dark-Eyed Junco. What an astonishing day!